Northeast Animal Shelter understands the importance of community. With our Senior Visitation Program, visitors from nursing homes, assisted living facilities, and day care programs come to our Shelter and spend time with some of our better-behaved pets. Schools and youth groups attend sessions at our Shelter, where we teach youths about the humane treatment of pets and proper pet care before their favorite part of the visit – spending time with some of our Shelter pets!. Read more about our Humane Education Program. 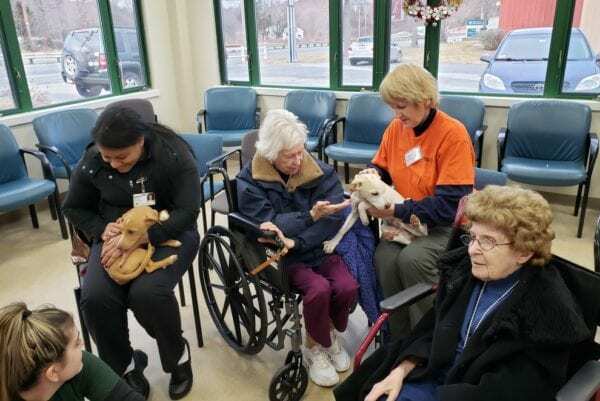 You can volunteer to help, and you’ll experience the joy of seeing how a four-legged friend can be the bright spot in the day of a senior citizens and the inspiration to help other homeless pets for our youths.